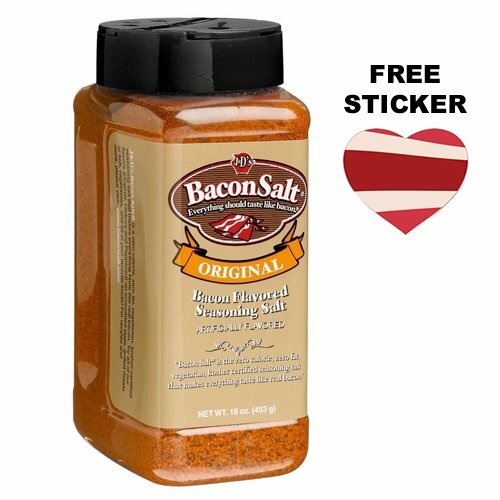 Includes: (1) Big Pig Original Bacon Salt (16 oz) + (1) Bacon Heart Sticker! Original Bacon Salt is like a straight bacon punch in the mouth. Great on Eggs, Mashed Potatoes, Vegetables, Salads, Sandwiches, French Fries and more! It is like bacon in a bottle (without the fat and calories!). Bacon Salt, a low sodium, zero calorie, zero fat, vegetarian and kosher seasoning that makes everything taste like bacon! Perfect for any occasion! EVERYTHING TASTES BETTER WITH BACON SALT! BIG PIG - JUMBO 16 OUNCE BOTTLE! SIX TIMES AS MUCH BACON SALT IN THE BIG PIG!! FAST & FREE US SHIPPING!! If you have any questions about this product by Bacon Addicts, contact us by completing and submitting the form below. If you are looking for a specif part number, please include it with your message.